It’s raining race bikes this week! 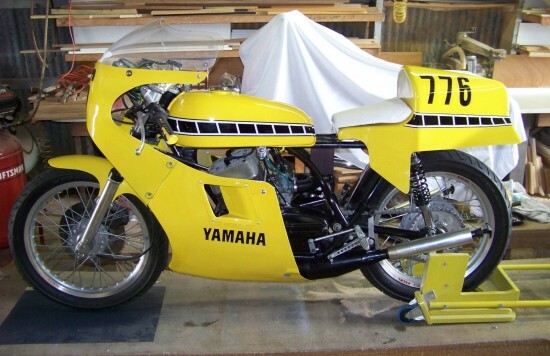 This example is a fully race-fettled, faired version of the popular, fast, and nimble Yamaha RD350. Streetbikes didn’t feature this example’s large, aerodynamic fairing, or that very interesting bladed trefoil tail section. 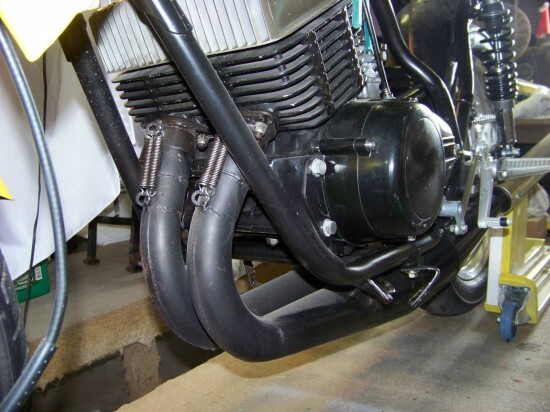 What streetbikes did feature was a lightweight parallel twin two-stroke that pumped out a genuine 40rwhp, making it a very quick middleweight sporting machine with good handling and reliability. 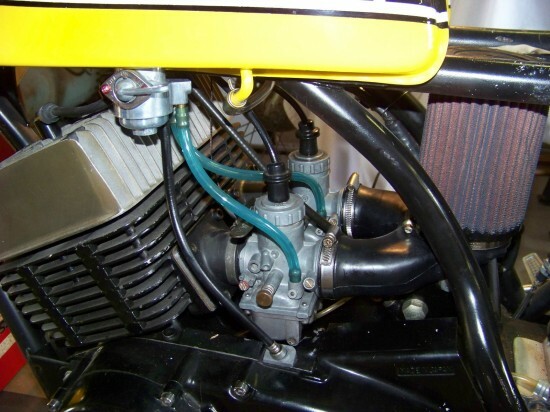 The transmission contained six speeds, and the RD350 used an automatic oil-injection system so owners didn’t have to ride around with a quart of two-stroke oil in their backpack… Although this bike has had its suggestively-name “Yamalube” system removed in the name of simplicity and weight-savings. 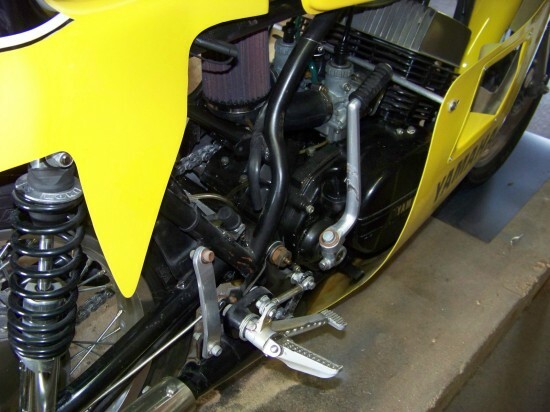 Frames were similar to the TZ series of racebikes and the RD’s handling was excellent, although the RD was much heavier than the purpose-built machines. Many RD’s were used as club racers and the bike bucks the prevalent image of 1970’s Japanese machines being fast in a straight line only. And while the brakes look a bit underwhelming compared to two-disc set ups, the system was powerful and well-regarded at the time. This is a RD 350 set up for Vintage Road Racing. I purchased this bike to fulfill an old dream of road racing. I was 55 at the time. I got my Motorcycle Competition License and headed for the track. I only ran the bike on Track Days (a couple of times, maybe 20 laps). I had a blast ! My mind was 18, but my body was not. Track time proved to be too expensive. I parked the bike in my house(well covered) drained tank and prepped it for storage. Now is the time for someone else to have FUN ! I just moved it to my shop and cleaned it up. Bought new battery and added gas/oil mix. It fired up in a couple of kicks. Revs and runs fine. I’m the third owner that I know of. Now for the list of goodies that make this bike outstanding. The bike was red when I purchased it. 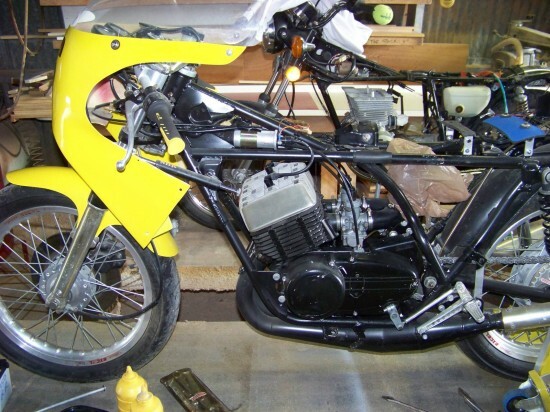 I have painted it Classic Yamaha Yellow with black and white racing stripes(Basecoat/Clearcoat). 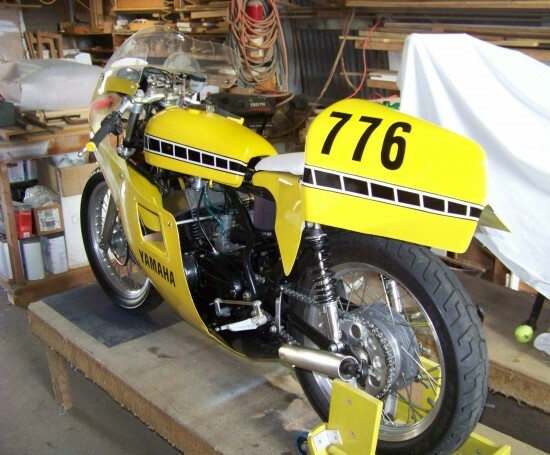 It has about 300 miles on the Top End, which was rebuilt with Genuine Yamaha parts by the previous owner. It has not been ported. Stock carbs with Boysen Power Reeds, 140 main jets(could go smaller), AirTech full TZ fairing and anti-draft seat and windscreen(with a few scratches), metal front fender(unknown origin), Raask rear sets, Spec II expansion chambers, Tapered steering head bearings, Brass swingarm bushings, NHK steering damper, ProFlo/K&N air filter, New aluminum clip-ons, Excel Aluminum rims, Dunlop K series tires(little wear), Nissin front master cylinder, New battery(under rear part of seat), Koni chrome steel rear shocks(not in production anymore), High Power coils w/NGK spark plug leads(new), Newly installed custom Sprocket Specialist 14 tooth front, 42 tooth rear for use with lighter weight RK XSO 520 Chain(all new). The oil pump was removed by previous owner, I use 32:1 premix Yamalube. These are very popular vintage rides, and only their high production numbers is keeping prices down. Set up for the track using quality components, this may not have the rarity or outright speed of a genuine TZ, but should be pretty good fun for less money, and the buzzy little 347cc motor can be hotted up to make significantly more power. Any of our loyal readers know anything about that tail section? Dad would pull ourr light green and white 1957 Chevy station wagon under a tree. will be hosting a performance by the “Multi-Grammy Winner” “Earth Wind and Fire. The Pottawattamie jail was built in l885 and is no longer in use as a jail but it is now a nice museum to go to.